Coming back from their second break of the day, players in today's $100,000 Guarantee $1,100 are getting their chips in action for Level 7. 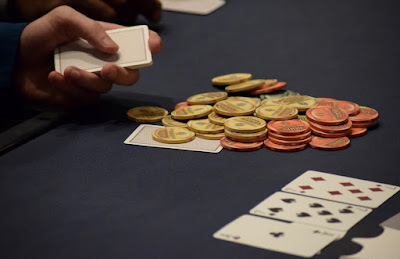 Registration and a single re-entry per player is available through the dinner break, closing when cards go in the air for the start of Level 10 at about 7pm. Plan is for play continuing tonight until the money bubble bursts - or the end of Level 19, whatever comes first - with players returning Friday at Noon to play down to a winner. Here's some assorted estimated chipcounts from around the tournament area inside the all-new TVPokerRoom.